Want straight teeth without cumbersome braces? Then Invisalign may be the right answer for you!! 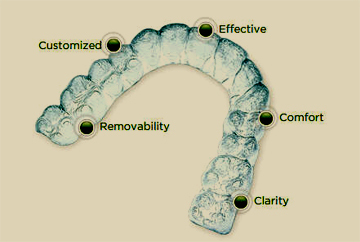 Invisalign consists of a series of clear aligner trays custom made for you. These trays can be removed to facilitate eating or brushing. Each tray is worn for about two weeks before being replaced by the next set of trays, until you achieve that wonderful smile with straight teeth. We will be glad to answer any questions you might have regarding this system.